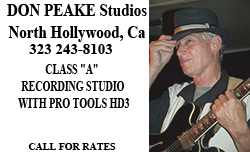 Don Peake was inducted into the Musician's Hall of Fame as a member of The Wrecking Crew! who has worked in the music business for many years. Don has composed music for many films, television shows, and commercials, including the Knight Rider TV series (77 episodes). Two of his films are Academy Award winners. Don has worked as guitarist and arranger for Ray Charles, Marvin Gaye, Barry White, The Beach Boys, Roy Orbison, Sonny and Cher, John Lennon, The Mamas and the Papas, Jermaine Jackson, and many, many others.